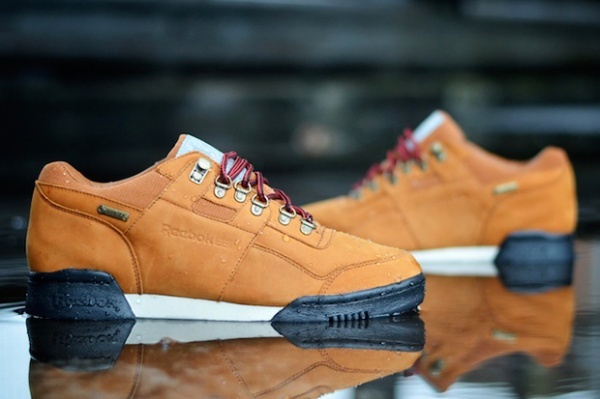 Reebok takes their ‘Workout Plus’ silhouette and preps it for the cold, wet winter months with this version featuring the technical material Gore-Tex. Along with the water-proof and breathable benefits of Gore-Tex, the Workout Plus’ athletic silhouette is beefed up with the use of hiking boot-inspired eyelets and thick rope laces. The sole is also beefed-up a bit to provide that needed traction once the snow falls. Overall, it’s a pretty nice reworking of the Reebok Workout Plus sneaker that provides some actual technical benefits to the wearer. Look out for the Reebok Workout Plus Gore-Tex edition to drop soon at selected Reebok retailers.